'Gideon Falls' is a gritty-looking and atmospheric suspense thriller that boils with tension and mystery. The story revolves around two very different men whose lives are meant to converge, drawn together by some untold power. It's a slow-burning tale meant to freak you the hell out. Norton is an out-patient from a mental institution who's obsessed with collecting pieces of trash -nails, scraps of wood, etc. - cataloging them and waiting for a sign that brings some sense to it all. His therapist warns that if he continues with this obsession it could mean a return to the hospital. What exactly is he waiting for, what big sign does he anticipate and does his dreams about a black barn have to do with anything? Lemire sets the stage giving the reader the bare minimum of information while giving Sorrentino all the time and space to set the mood with his incredibly scratchy style and ominous layouts. 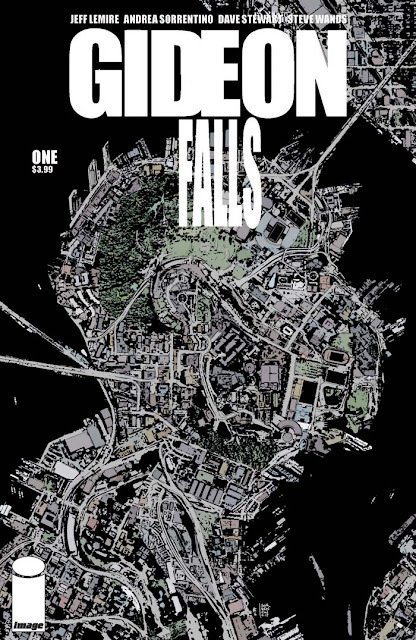 Father Wilfred is a priest with an undisclosed past sent to Gideon Falls to replace a pastor who's passed away. He goes reluctantly and it's obvious he's not thrilled with the assignment. He's welcomed by a kindly old lady in charge of the Catholic Women's League. She won't say how the last pastor died which is a bad omen. She's overly helpful which Wilfred appreciates but doesn't need right now. Nonetheless, Father Wilfred settles into his new surroundings but can't sleep as something draws him away from the house. These two are set to cross paths in one creepfest of a story laid out by Lemire but the bulk of the world-building is entrusted by Sorrentino and colorist Dave Stewart. It begins with minimal exposition as the visuals carry the story with Sorrentino focusing on Norton's actions and some of the best shots this side of a David Fincher movie. Stewart strategically uses colors mostly reds and grays with overexposed pastels in certain scenes. It all adds up to a quiet desolate atmosphere where anything can happen. When something does happen it makes it all the more surprising. Letterer Steve Wands does a dynamic job of customizing the letters to the scene and the character and it's just vital to the tone as anything else on the page. 'Gideons Falls' is a siren song of a thriller that is both alluring and unnerving. Lemire's script is a sharply pointed scalpel that gingerly scrapes against your senses with deliberate intent until the bloodletting begins. Sorrentino and Stewart build an atmosphere that is cold and sullen with plenty of room for the madness of evil men to spread their wings. This latest collaboration between Lemire and Sorrentino is a harmonious duet built on menace and anxiety. Just another must-buy Jeff Lemire book to add to your pull list.